Maryland, Washington DC, Virginia, Delaware, Pennsylvania, New Jersey, and Florida. 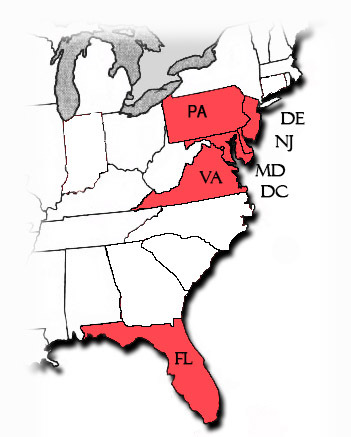 Our Maryland service area includes the Baltimore Metropolitan region: Anne Arundel County, Baltimore City, Baltimore County, Carroll County, Cecil County, Frederick County, Harford County, Howard County and the District of Columbia. Some of the towns in our Baltimore-Metropolitan service area include Aberdeen, Aberdeen Proving Grounds, Baltimore, Baltimore City, Bel Air, Boring, Bowleys Quarters, Brooklyn, Carney, Catonsville, Chase, Cockeysville, Columbia, Curtis Bay, Dundalk, Eldersburg, Essex, Glen Burnie, Greenspring, Hamiliton, Hampstead, Harford, Havre de Grace, Hunt Valley, Joppa, Joppatown, Little Italy, Lutherville, Middle River, Mt Airy, Nottingham, Owings Mills, Perry Hall, Park Heights, Parkville, Perry Hall, Pikesville, Randallstown, Reisterstown, Rosedale, Sykesville, Timonium, Towson, Westminster, White Marsh and other surrounding cities and towns.